Unlike steel and galvanized steel, aluminum will never rust, warp, or rot, so the structural integrity and original appearance remains intact longer than other common materials. Unlike any other material, aluminum is corrosion resistant; when it reacts with oxygen in the air, a thin layer of oxide forms and naturally protects the material from elemental corrosion. The layer of oxide may make the aluminum appear dull, but it does not impact the structural integrity. The oxide layer is self-repairing when damaged and provides better adhesion for paint primers and glues than other bare metals. Until the use of aluminum, galvanized steel was a popular choice because it was somewhat corrosion-resistant. A protective zinc coating applied to the material in the galvanization process prevents rusting initially; however, the zinc coating eventually develops a natural carbonate on its surface from the process of atmospheric sulfur dioxide combining with rainwater, resulting in sulfuric acid – the main component of acid rain. Sulfur dioxide is emitted from the combustion of fossil fuels which means there is a higher concentration in highly-industrialized areas (which is typically where these stairs are used) due to the high volume of transportation vehicles. The carbonate on the surface of the galvanized steel becomes brittle and eventually splits, exposing fresh zinc that corrodes. Since the zinc coating is thin, the base metal is also often exposed and corrodes as well. Takeaway: In highly-industrialized areas with a high volume of freight trucks, galvanized steel experiences corrosion while aluminum will maintain structural integrity. Aluminum is more corrosion-resistant than any other material and does not require regular maintenance. The only maintenance for aluminum stairs is to make sure that the pathway is free of snow, leaves, and other natural elements. For snow removal, we recommend a magnesium chloride ice melt because most typical ice melts are too harsh for aluminum and can damage the surface. This is in contrast to the routine maintenance require for galvanized steel stairs which will begin to rust if the protective zinc coating is scratched. Therefore, it is recommended to routinely apply a protective coating so that the barrier between the water and the metal is maintained. Property owners have expressed dissatisfaction with this required maintenance of galvanized steel. When stairs are located in a region where it snows, removal of ice and snow can be problematic because all ice melts eat away at the zinc coating. Property owners are reporting that steel is extremely hard to maintain, especially in climates where it rains and snows often, and aluminum is much less work. Our product is prefabricated, so it requires only a few bolts for assembly. While steel is also prefabricated, aluminum is much lighter which means that the aluminum loading dock stairs are easier and faster to install and require less manpower. 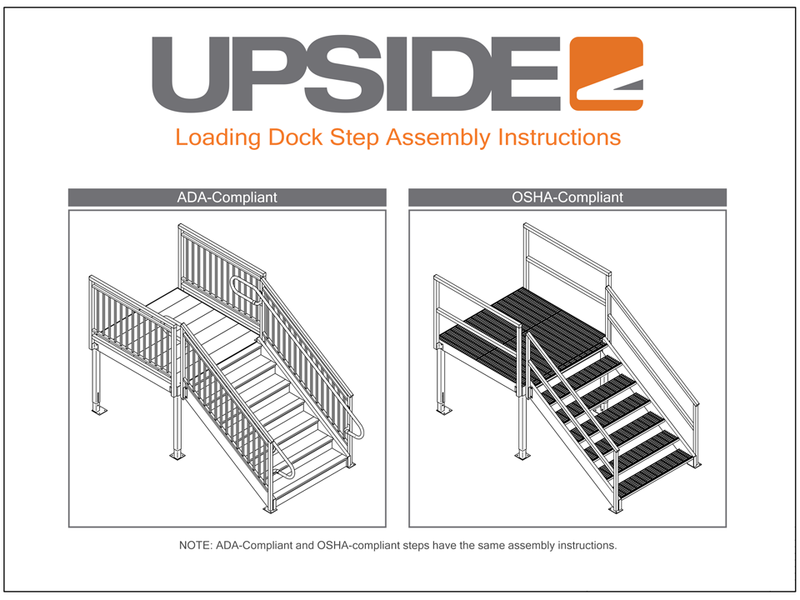 Check out our dock step installation guide to see just how easy it is. Someone with no experience could assemble a dock-high stair system in a couple hours. Aluminum is meets the capacity requirements and it’s easier than steel to install because it is lightweight. Aluminum is approximately 1/3 the density of steel and weighs much less. Upside Innovations’ distributed load is 100 lbs. per square foot with a point load of 300 lbs., the load requirements specified by the International Building Code for new construction means of egress. While galvanized steel is stronger than aluminum, aluminum exceeds the requirements for pedestrian access applications and is preferred because of its many other benefits. 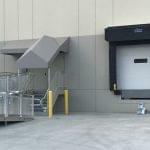 Property owners can save money upfront by switching from galvanized steel loading dock stairs to aluminum. Typically steel stairs are manufactured by small, local companies that have less capital which means higher prices. One of the largest commercial real estate companies in the world, Prologis, just changed its new construction specifications from galvanized steel dock-high steps to Upside Innovations’ aluminum dock-high steps. Switching to aluminum will save them roughly 20-30% up front and an additional variable amount from reduced yearly maintenance costs. The cost per unit for the previously used galvanized steel stairs was high because the stairs were produced on a project-to-project basis by local, custom steel fabricators that didn’t have large-scale production capabilities. Upside Innovations has a large-scale manufacturing operation of aluminum stairs for nationwide delivery, meaning that the cost per unit is drastically lower than the aforementioned galvanized stairs. There are instances when the upfront price of aluminum loading dock stairs is not always less expensive than galvanized steel because the raw material is typically more expensive; however, the cost of the cost of aluminum stairs over the course of their life will be less because galvanized steel incurs routine maintenance costs whereas aluminum does not. Over time, aluminum has proven to be less expensive because galvanized steel requires yearly maintenance costs.